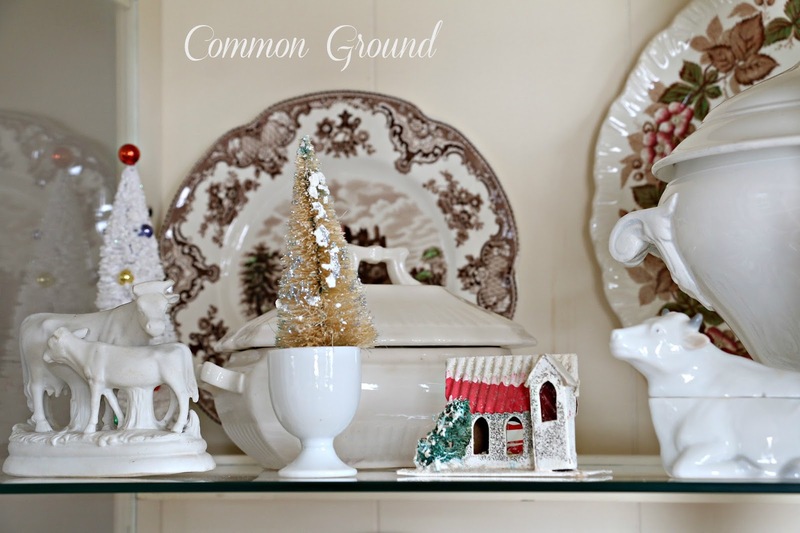 common ground : Christmas China Cabinet and a Winner! 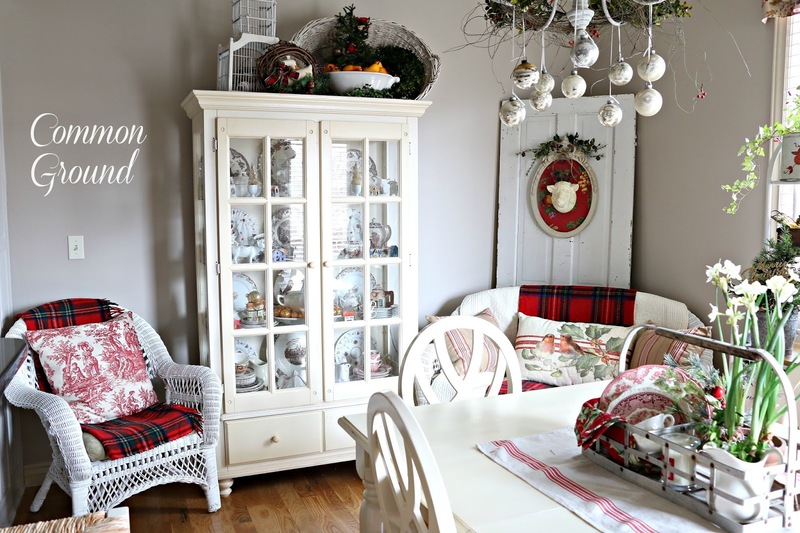 Christmas China Cabinet and a Winner! When you go through a move you just have to expect that things will change. Room sizes, function, and wanting a different look all cause the upset of the proverbial apple cart...even down to kitchen cabinets, dishes, and how you display things. 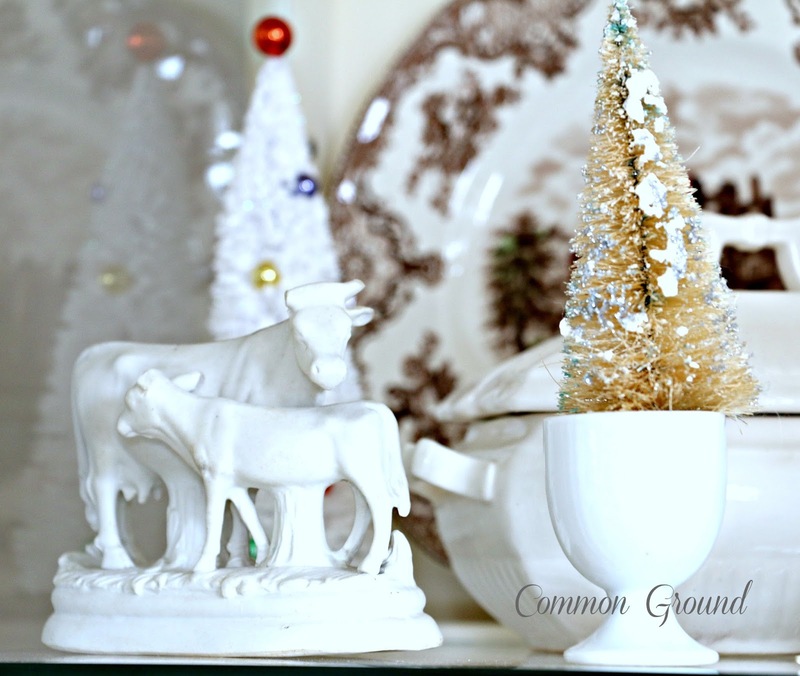 While we were at the lease house, I used my vintage pie safe in the kitchen to display some seasonal and holiday items along with a frequently changing array of transferware and ironstone. 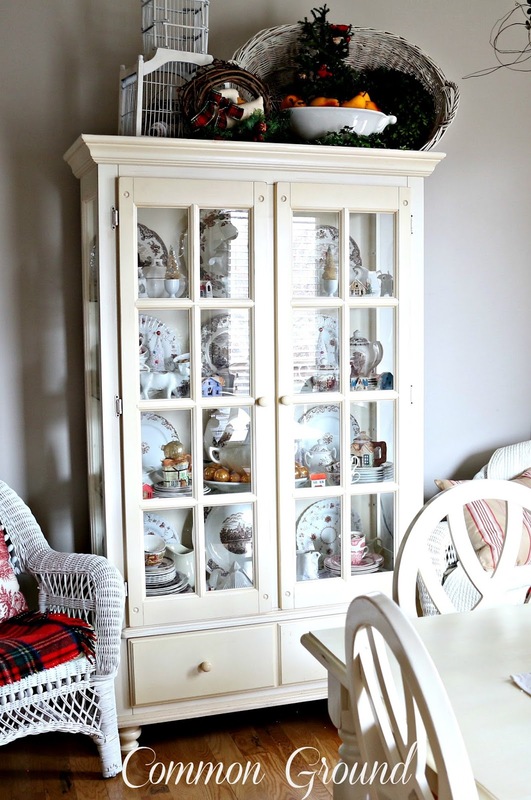 But I decided to use the pie safe downstairs for a kitchen grouping, and bring back my Antique White China Cabinet that matches the table and chairs. The China Cabinet and table and chairs had been in storage this last year, so I was really glad to see them all again! In the past I'd had my French Faience in this cabinet with my blue crystal and odds and ends of floral teapots, cups and saucers, and some Depression Glass. 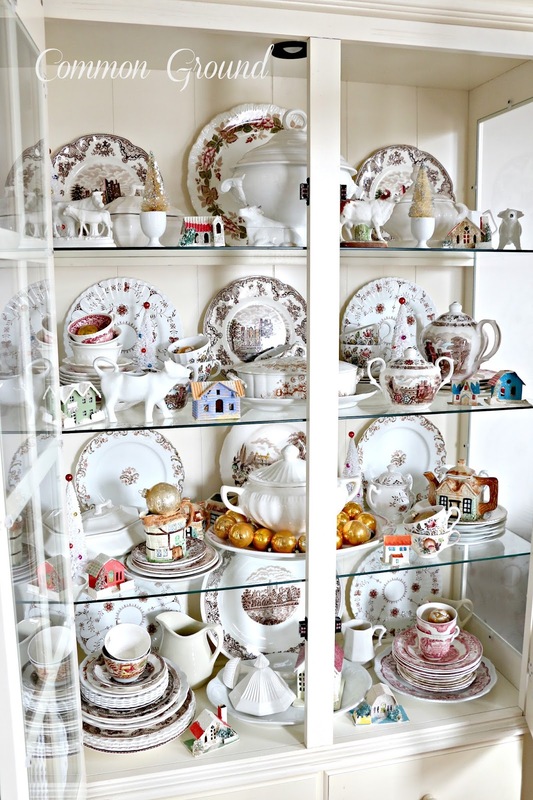 But when we moved and the "Holiday Cupboard" was sold (boo hoo) I needed a place to decorate seasonally with dishes and to enjoy my different sets of Transferware. I put out my Brown Transferware when we first moved in this Fall. I kept thinking I'd change it out for the Red but time got away from me. So there are only a few red pieces on display. 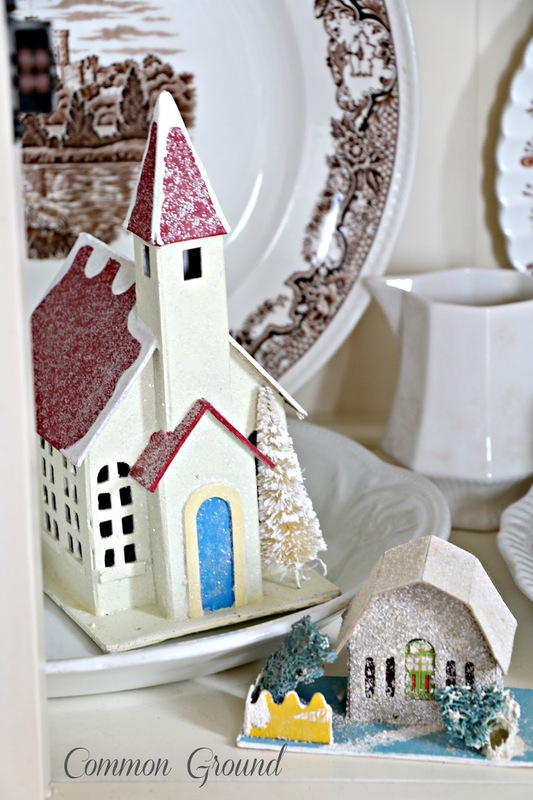 But I added some Christmas fun with vintage bottle brush trees and a few of my Putz Houses. 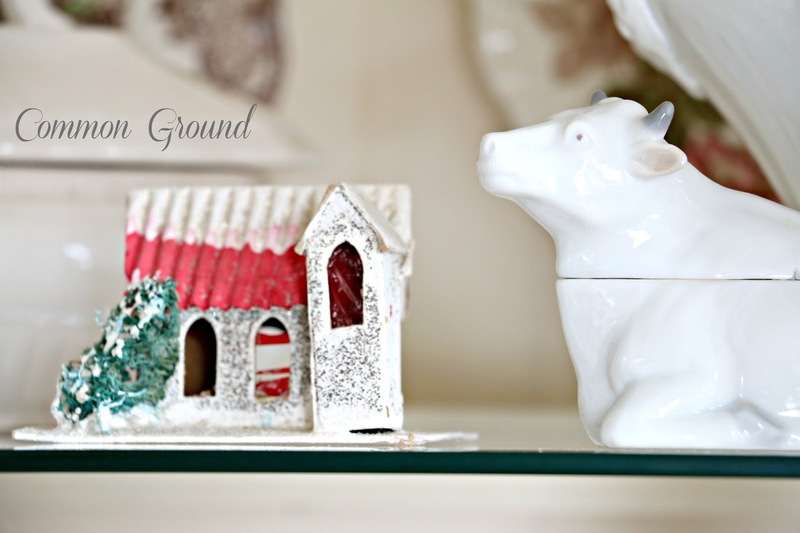 My cows and creamers, and then lot's of vintage ornaments are making it a little more Christmas-y. Doesn't everyone need a few "Christmas Cows"? These two vintage egg cups are perfect bottle brush tree holders. I mainly have bits and pieces, not full sets of my Transferware, but since I mix and match, it all gets stacked together. More Christmas details from around the house, coming soon. It was the Moonlight White Tree. I love it. I can't believe the holiday cupboard is sold. I loved that cabinet. This is darling too and I love all of your transferware. So pretty. I have the Pink Castles too. Such a pretty pattern. I love your cows! Debra, your cabinet is beautifully dressed for the holidays. Of course, everyone needs a Christmas cow or two. '-) You've give me an idea of how to use the little cardboard houses a friend gave me a few years ago. They are currently on my table as a centerpiece, but I like using them on the shelves individually. May do that for winter once the holidays are past. Hi Debra! Oh, I'm so glad you brought this lovely set back - it's wonderful and I love how you've decorated it too. I love cow creamers and you have some great ones. Your little glitter houses are so sweet too. Hope you're doing well. Your white cabinet filled with transfer ware is gorgeous!!! 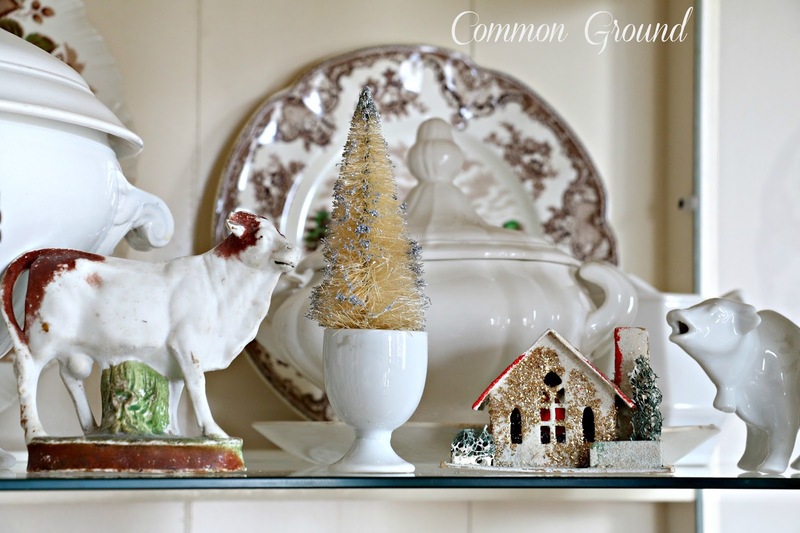 I love the touches of vintage Shiny Brite ornaments and bottle brush trees for Christmas decor within the shelves!!! The vignette atop the cabinet is absolutely stunning!!! 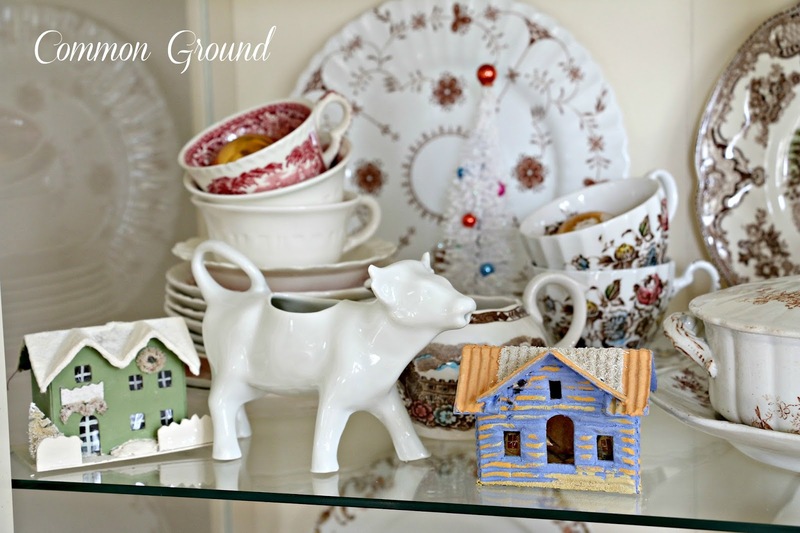 This is all so pretty, Debra...I love the red transferware, and the cows, and the putz houses...I LOVE everything! Everything look so pretty Debra!! 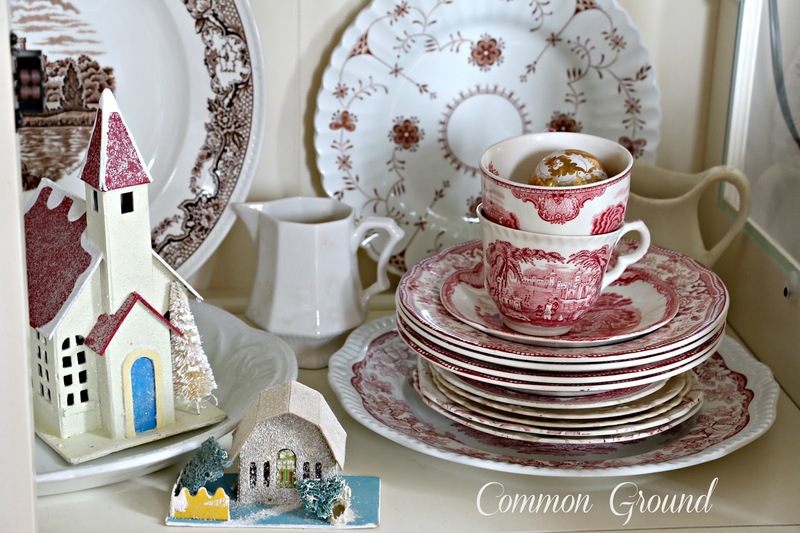 Your cabinet looks so great all dressed up with your pretty transferware for the holidays. You cabinet looks really sweet with the table and chairs. I love transferware, too! What a pretty breakfast room you have. The cabinet is gorgeous and your attention to detail makes me happy. I greatly admire in others those particular gifts that I lack! This past summer, I saw Friendly Village pieces for sale in an antique shop in Maine for very reasonable prices, and now I'm kicking myself for not snatching them up. Lesson learned. Merry Christmas! 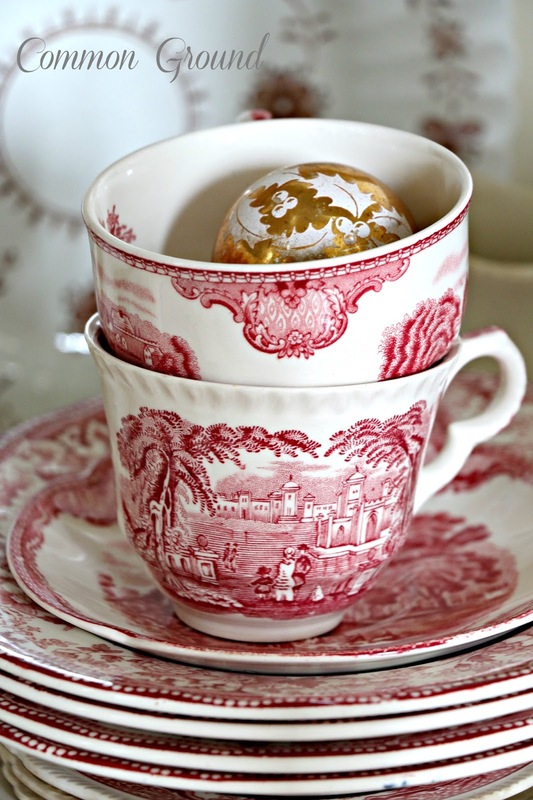 I adore transferware and featured some this week. Love your cabinet and it looks wonderful holding all your treasures. When we downsize a final time, I'm going to have to get myself a new cabinet because the one I have now is built in. Your breakfast room looks so cozy and I see touches that mimic my own. Love the toile and pops of red. Merry Christmas to you and your loved ones, Debra! 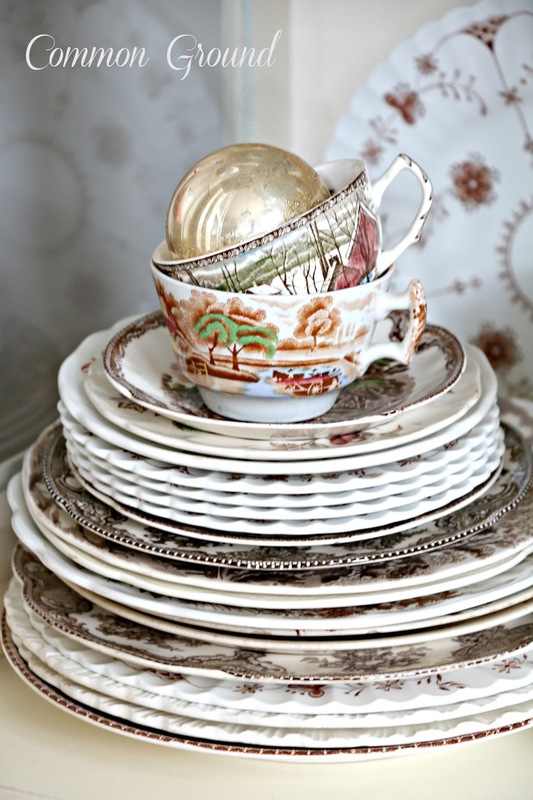 It looks beautiful with all your vintage dishes. I love transferware too, just can't have enough! I love the toile pillow and reminded me I have some fabric in the craft room. I still have time to make a few! What a great cabinet, Debra! It looks beautiful, too. 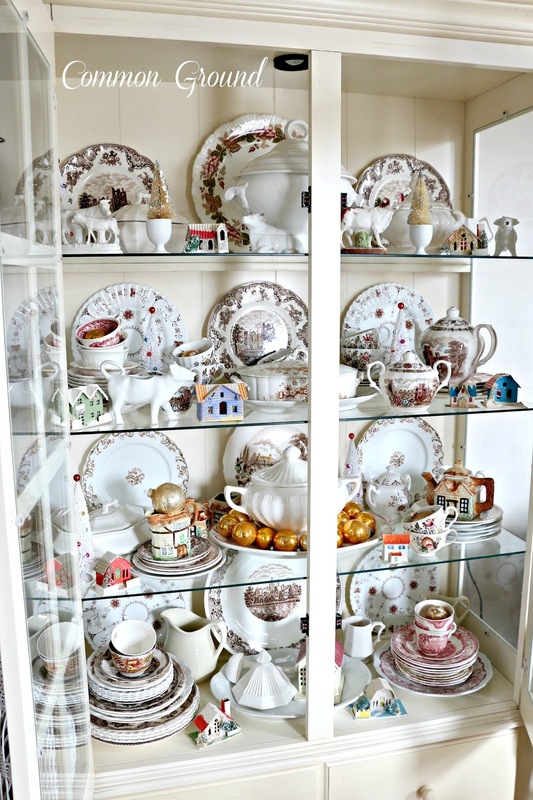 I love transferware so seeing yours displayed in here is a pleasure. Love how you've interspersed your bottle brush trees and putz houses. It all looks gorgeous Debra! I love mixing and matching much more than complete sets. The cows are fun. I put my cow creamer away in the basement kitchen. Maybe I need to pull him back out! lol! Congrats to Julie Marie! Have a very Merry Christmas! Your cupboard is so pretty. I adore all the putz houses - - you have such a wonderful collection of them. All so lovely, lovely lady! I'm taking a little break but I wanted to say, blessings to you and yours this Christmas and a blessed New Year. I missed this post! I was viewing the milk carrier post and missed a post on dishes! 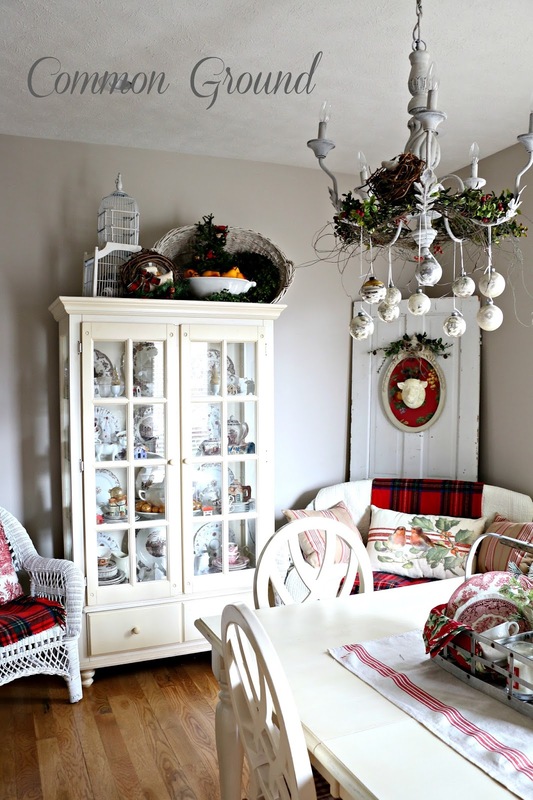 I do love a cabinet to display dishes (still looking for the perfect one for my house to no avail), and the milk carrier on the table pulls it all together for a homey Christmas, in spite of not finding everything. You obviously found just the right amounts. Merry Christmas, Debra!